Every bathroom is in need of a makeover at some point in time. 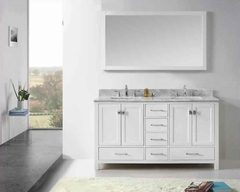 Getting updated bathroom furniture such as new bathroom cabinets, bathroom vanities, single vanities and double vanities will change the entire look of the bathroom. Purchasing new bathroom cabinets can provide style and extra storage you. Having the right amount storage in the right places is important. You must have a good storage place to put bathroom items like extra towels and supplies. This gives you the opportunity you to have your bathroom organized all of the time. Bathroom furniture such as single sink vanities and double sink vanities are a smart way to improve the way the bathroom looks and add storage space. The measurements of the bathroom will be a major factor in what kind of bathroom furniture you’ll need. A double vanity may take up more floor space but will provide function and storage as will a single vanity. You can choose to install a double sink vanity or single sink vanity to have great style and flare in your bathroom. You may also choose the material used, the finish, style, size and color to tailor the furniture to your needs. You’ll have a completely fresh look for your bathroom simply by replacing or adding cabinets and bathroom vanities.